For decades, the world meteorological satellite community has operated under a policy of freely shared data – no restrictions and unencrypted – available at no cost. It is a philosophy and model of cooperation, first promoted by the United States and adopted by global satellite agencies, that endures regardless of political or national persuasion. It is also a model embraced and facilitated by Liam Gumley, a scientist at the University of Wisconsin-Madison Space Science and Engineering Center (SSEC). 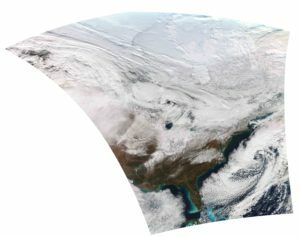 Users, from scientists to the general public, can access these weather satellite data in a couple of ways, says Gumley. 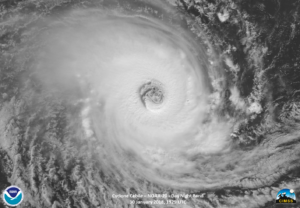 Data collected from all United States’ geostationary and polar orbiting environmental satellites are stored in the National Oceanic and Atmospheric Administration’s (NOAA) CLASS archive (Comprehensive Large Array-Data Stewardship System) within about ten hours of collection on the spacecraft. Anyone can visit CLASS and download these data. Those with an interest or need to obtain the data sooner, like weather agencies for forecasting purposes, can install an antenna and appropriate hardware to receive data in real time, directly from the spacecraft. Within minutes of digitization on the spacecraft, this direct broadcast data is transmitted to receivers below. Gumley notes that developing countries can receive the data at a lower cost through a process known as re-broadcast. In this case, NOAA or EUMETSAT, the European satellite agency, receive and process the data, uplink it to a telecommunications satellite, and then beam it back down on a signal similar to that of a digital television. For less than a thousand dollars, anyone with a small antenna or a computer can receive the re-broadcast data, says Gumley. “We are not doing rebroadcast directly at SSEC,” says Gumley, “but we do have an agreement with EUMETSAT, the European satellite agency, to work with data that it rebroadcasts over Europe as part of a system called EUMETcast.” It, too, uses telecommunications satellites to disseminate near real-time delivery of satellite data and other products. The launch of JPSS-1 (named NOAA-20 post-launch), the first in an advanced series of polar-orbiting weather satellites, on Nov. 18, 2017, offers these users another unique opportunity to gather timely data critical to their work. From its low orbit, just over 500 miles above the Earth, NOAA-20 will circle the planet 14 times each day, collecting high resolution data in consecutive swaths in order to construct a picture of the planet twice a day. It forms the backbone of the global observing system, delivering detailed information on the state of the atmosphere, land, and oceans. NOAA-20 joins its predecessor, Suomi-NPP (so-named for SSEC’s founder, Verner Suomi), as well as satellites operated by other countries, in making important measurements of Earth’s environment. According to Gumley, these data are being used in three distinct ways by his team, scientists at SSEC, and worldwide: to improve forecasts, to assist in real-time decision-making, and to analyze global environmental processes over longer periods of time. Improving forecasts is paramount to scientists like Gumley. The data from these satellites—all of which have infrared and microwave sensors onboard—are crucial to weather prediction models, or numerical weather prediction (NWP), that are at the heart of U.S. forecasting. NWP harnesses the power of computers to run algorithms that process massive amounts of satellite data. Data from other sources, such as weather balloons, aircraft, ground-based instruments, are also processed in NWP models, but “by far, the most important data source is the satellite data,” says Gumley. In addition to improving forecasts, these data play a role in decision-making, especially when time is of the essence. 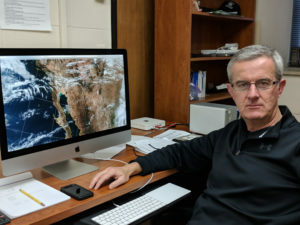 Scientists at the UW have the advantage of access to SSEC’s Satellite Data Services where satellite data from numerous satellites are ingested and archived daily. With nearly immediate access, scientists like Gumley can view and analyze satellite data streams and imagery in 15 minutes, sometimes less. Getting that information to decision-makers as soon as possible is key. To support the process of decision-making in the U.S. and to make it more economical for other countries, Gumley’s team has developed a suite of software called the Community Satellite Processing Package (CSPP) that can be downloaded by anyone, without cost or restriction, from the program’s website. 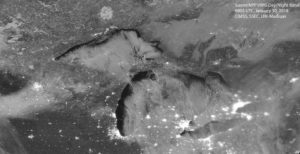 As part of a community effort, SSEC and partner sites have developed CSPP products that convert the digital satellite signal to useable information. By running any of the CSPP products users can detect fires, calculate cloud heights, analyze sea or land surface temperatures, read temperature and water vapor information, or assess vegetation, and much more, to aid in weather forecasting and disaster response. CSPP can help keep real-time decision-making under local control. Collaborating with others to make these polar-orbiting satellite data available, and constructing pathways to understanding them, has deep roots at SSEC, dating back to the early 1980s. At that time, SSEC scientists developed the first International TOVS Processing Package to process data from instruments on NOAA’s early polar-orbiting satellite series known as TIROS. Finally, researchers are using these data to study global processes over an extended period of time, 20-30 years, to determine climate trends. Suomi NPP VIIRS true color image over the continental U.S. on January 18, 2018. Credit: Data acquired and processed via SSEC direct broadcast antenna. Scientists have already determined that clouds are one important variable in the global radiation budget. For today, says Gumley, the question is: “Are we seeing more or less high clouds as a result of climate change?” The opportunity to amass more data over longer periods of time, makes identifying trends more reliable. NOAA-20 will continue these and other types of observations that have been collected from previous generations of satellites and archived for the last 25 years. But before the data can be used for climate research, Gumley’s group is part of the ground team that has been tasked with characterizing the data from NOAA-20 in terms of its completeness, validity, accuracy, and consistency. Starting three days after launch, and as sensors onboard the spacecraft were turned on, his team has been working with NASA and NOAA to ensure the integrity of several terabytes of data each day. 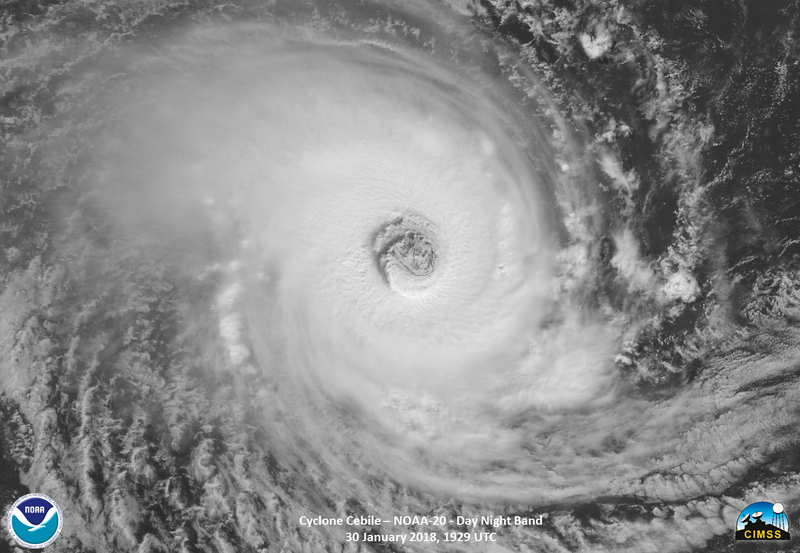 To support long-term climate study, SSEC had a contract with NASA to create atmosphere products—known as Science Investigator-led Processing Systems or SIPS—from the Suomi-NPP VIIRS sensor. That agreement extends to data from NOAA-20 as well. These datasets are processed over the course of a mission, reprocessed from time-to-time, and forwarded to NASA for archiving and distribution. Only one of the six groups involved in the SIPS development is based at an organization outside of NASA: the one based at SSEC. For Gumley, it is rewarding to work within a global collaboration where despite differing environments and locations, everyone is receiving the same data and is interested in using it for improving forecasts and studying environmental conditions. This work was supported by NASA and NOAA.